*this post contains affiliate links. 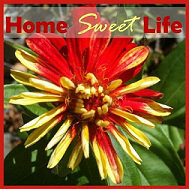 If you make a purchase, it will not cost you any extra, but it will help fuel our blog - thank you! 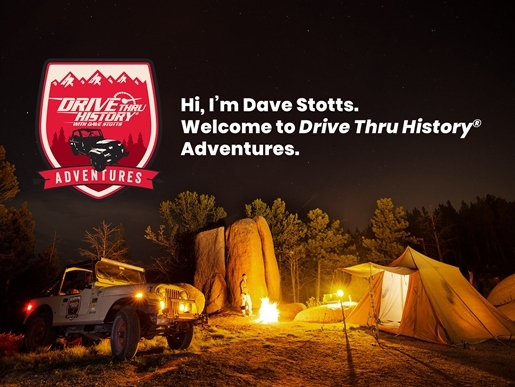 Our family loves exploring history, so we were happy to jump onboard when the Homeschool Review Crew was presented the opportunity to review the new Drive Thru History Adventures with Dave Stotts and Drive Thru History TV app. 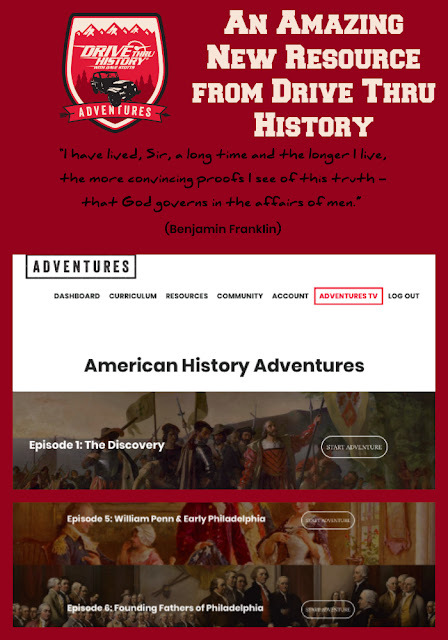 This online homeschool history curriculum currently has three offerings: Bible History Adventures, American History Adventures, and Ancient History Adventures. An Annual subscription to Drive Thru History Adventures gains you access to all three courses. The American and Ancient history courses each contain 12 lessons, while the Bible history course contains 18 lessons. Dave Stotts hosts each of these Adventures and takes a good bit of humor, mixes it with history lessons, and points the lesson back to how it effects our lives today. Dave also includes thoughts on how the events in history, and the people who were involved were guided by their devotion to God, or lack thereof. 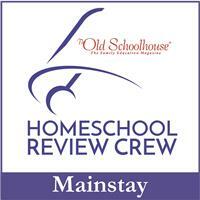 For this review Arlene chose to work on the 12 lessons in the American History Adventures. Normally you would do one lesson a week, but, Arlene is a bit of an overachiever when it comes to history, especially American history, that might have something to do with her six+ years as a Civil War re-enactor, so she did all 12 in four weeks. Each lesson in this series includes a 30 minute video, reading of primary source documents, and a worksheet with discussion questions. The American History Adventures course covers the time from Columbus to the Constitution of the United States, with the bulk of the time spent on the American Revolution. The primary source documents are available to read online or can be downloaded and printed if desired, as they are in a PDF format. Before I go much further, I want to take minute to explain how we use Drive Thru History Adventures, and give you some suggestions for your own family. Arlene is 17 years old and does almost all of her coursework independently. That means she logs in, watches the videos, reads the accompanying primary source documents, and then we discuss her lesson while making dinner that evening. I do not make her write out the answers to the discussion questions, but we have looked them over. We discuss what she learned, because I have found that if she can re-tell it to me, she had cemented the learning. If you have a family of mixed ages that want to study history together, you can adapt the various part of the curriculum to fit your individual children. Everyone can watch the videos together, but skip the primary source readings and written answers for the younger kids. You might want to have printed off the discussion questions beforehand and have everyone discuss them before you send your teens off to read, or you might only assign these questions to the older students. For the American History Adventures, some of the primary source documents are rather long and require a high reading comprehension level. It is not expected that your student will understand everything they read, or even agree with it, but the opportunity to try is invaluable. 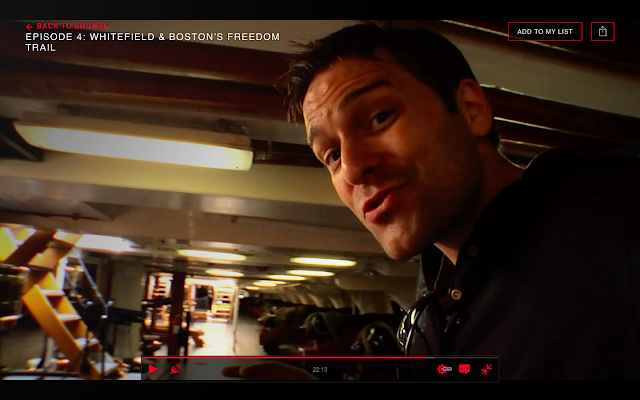 The Video for Episode 4 in this American History Adventures series includes the history of George Whitefield and the First Great Awakening, as well as a walk along Boston's Freedom Trail and an inside tour of the U.S.S. Constitution. There are two primary source documents to read for this lesson: George Whitfield's Marks of a True Conversion, and Jonathan Edwards' Sinners in the Hands of an Angry God. One is 14 pages long, the other 16 pages long. This is representative of the amount of reading expected by high school students, so if your students are younger, don't stress - they will still get a lot of history learning in just by watching the videos. Arlene and I discussed the mercy of God and how Edwards portrayed the plight of sinners in his sermon. Yes, these are Christian history lessons. They do not pretend everything in the past was beautiful and perfect, rather, Dave Stott does an admirable job of showing viewers how the faith of those early Americans gave them the strength to follow what God had called them to do - persevere in the face of hardship and adversity. Your one year subscription to Drive Thru History Adventures also unlocks the benefits of using the Adventures TV app on your phone or tablet. 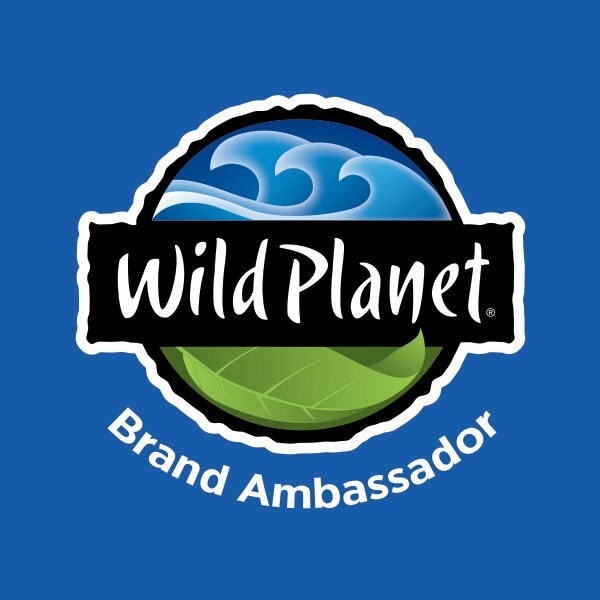 This app allows access to all of your videos in the three history adventures, as well as other videos like Dave's Adventures (which includes the weekly mailbag videos,) Side Roads videos, Behind the Scenes videos, and Dig Deeper videos. The Adventures TV app does not include the primary source documents of the discussion questions - for those you'll need to log in to the website. 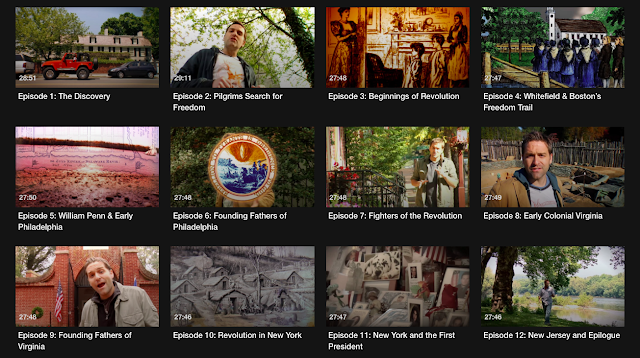 What the app does do is gives you the freedom to travel with your history videos. Think about being able to take your videos along to watch while waiting at the Doctor's office (with headphones of course) or by sending them to your tv via Chromecast or an AppleTV device. Or if it is warm outside, you'll find Arlene on the porch swing in in the pa tree with the iPad. 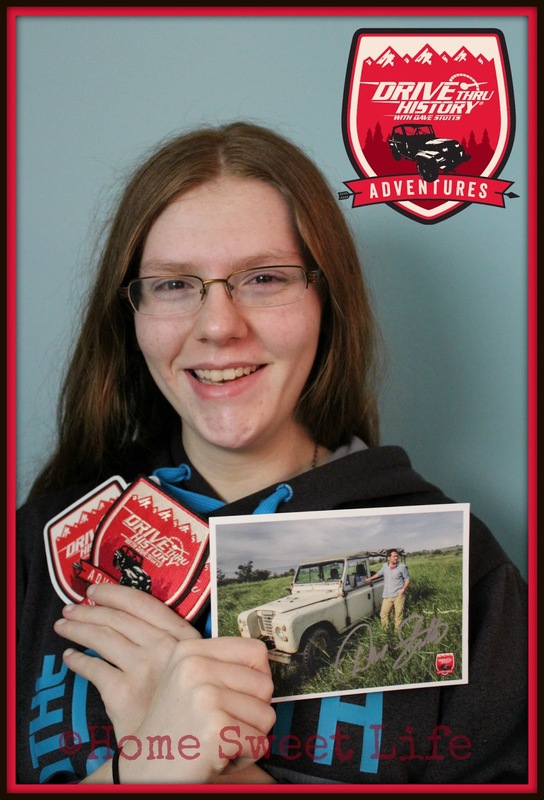 You can also watch the videos via Adventures TV on your computer. I really like the Adventures TV app because it bookmarks your viewing of the videos. Start watching it on your phone, and when you return that episode is at the top of the page with a Continue Watching button. Drive Thru History Adventures is so cool because it is not just the episodes (which are cool enough on their own), it is the episodes of three of the series plus historical documents that go with different episodes and extra articles and reading to go along with the episodes so you can learn more plus different shorter videos by done each week by Dave covering everything from how we got penicillin to the history of cheese. There are also videos by others that talk about ancient coins and ones that talk about the origins of different holidays. Oh and it has behind the scenes videos on all sorts of different things, like, did you know that there is a Drive Thru History section at the Museum of the Bible in Washington D. C.? Oh and of course there are bloopers! So that is a lot and its kind of one long sentence and as I reread it I can hear mom in my head telling me to use less conjunctions and more punctuation but there is just so much stuff! So what do I like particularly about the videos? As I said above I love history and finding a video series that has both amazing quality information and great production quality where I can just watch knowing it is Biblical and not have to be worried about millions of years popping up is so nice! The videos themselves have tons of information and it is totally ok to re-watch them over and over agin because you are sure to remember something new each time. The also make history fun! Dave is never afraid to make a joke to keep the show going and even as an older kid I don’t find the jokes annoying I find it nice that he can show people that history isn't just dead people and old stuff but that it is alive all around us and still impacts how we live today. I love that he doesn’t just show pictures and talk but goes to the places he is talking about. Seeing the places, some of which I had only ever read about before, was super cool and gave me a helpful visual aid for the next time I read something about that place and time. Last time we did a review it was just for the videos but this time it is for the new Drive Thru History Adventures a site with so much stuff it is hard to know where to begin! The site was so cool because after watching the videos I could read historical documents that went along with what I had just watched and then if I wanted to know more I could read other articles that helped me learn even more about the time period I had just learned about in the episode. It was also cool because I could watch behind the scenes videos of how they made the show and my favorite, bloopers! Dave also has new videos posting all the time on all sorts of different things. I learned more about the history of so many different Holidays from Valentines day to Veterans Day, Groundhogs Day to Reformation day. There are also videos by people besides Dave talking about cool things like ancient coins, and tours of the construction of the Museum of the Bible which has a section just for Drive Thru History. Oh and it has worksheets if you are into that sort of thing. I never really was, but I know lots of parents LOVE worksheets and the site has them to go with each episode. So you are probably thinking that this sounds cool but you don't know if you want to spend the money for a whole year’s subscription since I might not have convinced you yet that it is worth the price. So let me say it plainly. It is TOTALLY WORTH THE PRICE! In fact when you think about the cost of other history programs and curriculum out there it is a FANTASTIC price. Because it is not just one history course but three! Plus it is fun which means your kids will actually want to do it! And what parent doesn't want a school program that they know is good and they won’t have to make their kids do? So yes, it may seem expensive at first but it is totally worth it because its not one of those only one or two kids at a time can use it things like some other programs. You can have a younger kid learning American history and an older one learning the history of the Gospels at the same time! Plus did I mention that there is an app? You can access all of Drive Thru History Adventures videos right from your phone (because even adults need a refresher course once in a while), or your kid’s tablet without having to go through the bother of remembering which of the two dozen tabs you have open is the right one! So if you are not sure get it for a month and try it out, after a month most of you will probably want to get it for another year because its just that awesome! So I’ll end now because this is supposed to go with mom’s review and not instead of and I’m already way over the word count minimum without mom’s help. Just to wrap up a few more details, Drive Thru History Adventures is available as either a monthly or annual subscription. Right now, if you choose the Annual Subscription, they will send you a copy of The Gospels DVD set at no additional charge. You can see those details here. Arlene and I reviewed The Gospels set last year and it was Arlene's favorite course or review item of the entire year! So why Drive Thru History Adventures? Because it is a fun, immersive style of learning history. We cannot all physically travel to Boston, Portugal, and New Jersey each year to learn about American history, but with Drive Thru History you will step away feeling like you've been there. Learning through stories improves retention, but learning alongside Dave Stotts is just plain fun!